"Shaker" finishes his Championship at only 8 months old!!! 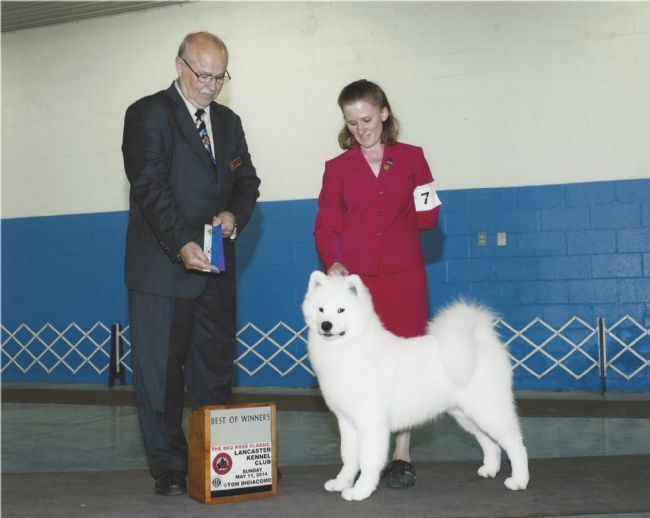 "Shaker" White Magic's Shake Your Groove Thing finishes his Championship in a big way by winning Winners Dog at the Greater Pittsburgh Samoyed Club Supported Entry on 5/26/14 on his 8 month birthday:)!! Shaker is a Mufasa x Hollis baby! "Shaker" finished his Championship w/ (1) 5 point major and (2) 4 point majors all from the Bred-By-Exhibitor Class!! White Magic had an awesome weekend in New Castle, PA at the Greater Pittsburgh Samoyed Club 3 Supported entries and 2 Specialties!! !